Challenge weekend has been and gone and what a weekend it was! With a mad dash to the airport we arrived at Disneyland Paris at around 6.30pm ready for our first Disney run at 7pm! To say it was a quick turnaround was an understatement! Costumes ready, we were at the starting area. Millions of people all around, all ready to start their own challenges. The atmosphere was electric! The 5km race had a Marvel theme so being set off at the start line by Captain America was very different. “3, 2, 1, GO!” shouted the crowd. The nerves of being part of something so huge quickly turned into excitement. Running around the Disney parks and seeing areas that you would never see as a tourist was amazing. Opportunities had to be taken for pictures in areas that you would never ever get to see again in the same way. Running with so many people from so many nationalities with different costumes is something that we will never experience again. Some costumes were out of this world! They definitely put ours to shame. The dedication of all runners was clear but the dedication put into their costumes was something else. 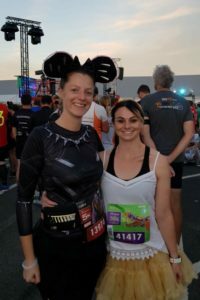 During the run there were characters along the course – it’s not every day you can say you ran with Black Panther and Thor. Crossing the finish line was an amazing experience, feeling the achievement for ourselves and those around us. We were very impressed with the medals and made it all worthwhile. 6am Saturday was the wake-up call we were dreading but also excited about, it was 10km day. Blurry eyed, up we got, put our next costumes on and off we headed to the start line. This time it had a much calmer feeling but then again it was 6.30am! The atmosphere was different but watching the sun appear over the buildings in Disneyland was wonderful. Today the theme was Disney Villain sidekicks and our starters for the race were Meg, Pain and Panic from Hercules. The crowd were shouting “3, 2, 1!” again and off we went. Legs feeling a more bit tired than the day before but that didn’t stop us. Today we knew we were going to get the picture that everyone wants when they go to Disneyland, Sleeping Beauty’s castle! Running down Main Street towards the castle with no pushing or avoiding groups of people doesn’t happen very often so we took full advantage and took in our surroundings. It was what we were all looking forward to, it definitely had that Disney feeling! In front of the castle the photographers were poised and ready to go. A quick snap or 2 and off we went again. This time we were running through Disneyland, passing all of the attractions that we grew up with was a surreal experience. It was so quiet without the noises of the machines working away and screams of excited children (and adults). Running along, just like the 5km, Disney characters were along the route as well as cheerful, supportive cast members. It made the run just a little bit more enjoyable and manageable. Back into Disney Studios, the finish line was in sight. Smiling faces everywhere. Another race ticked off the list. One more to go! Another early morning start. After 2 full races and a day in the parks this morning was a little bit harder, legs a little stiffer. Only 21km to go. Doubt creeping in, can this be done? We had come this far, it had to be done! 6.30am again but today had a more serious feel. This was pure dedication. Today the theme was villains. Cruella was setting us off, “3, 2 1!” was heard for the last time. Here we go. Only a short 21km … Today the race took us out of the park and along the roads surrounding the park. The views were beautiful. It was nice, however, when we headed back into Disney we knew we were home. Over 2 hours later, the challenge was complete. 36km done. Shattered wasn’t the word for it but we were so ecstatic that such a massive challenge had been achieved. The support from family, friends, Disney characters, Disney cast members and other runners was what got us through. Thank you for all of the support you have given us.